Pope County is a county located in the U.S. state of Illinois. According to the 2010 census, it had a population of 4,470, making it the second-least populous county in Illinois. Its county seat is Golconda. The county was organized in 1816 from portions of Gallatin and Johnson counties and named after Nathaniel Pope, a politician and jurist from the Illinois Territory and State of Illinois. The first permanent settlement in future Pope County was established in 1798 at the modern-day site of Golconda, then a part of the Northwest Territory which operated as a ferry point across the Ohio River. The county was formed in 1816 from portions of Gallatin and Johnson Counties. 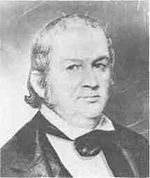 Nathaniel Pope, a politician and jurist from the Illinois Territory and State of Illinois was the Pope County namesake. According to the U.S. Census Bureau, the county has a total area of 374 square miles (970 km2), of which 369 square miles (960 km2) is land and 5.5 square miles (14 km2) (1.5%) is water. The entire county is hilly and during rainy weather rivulets cascade down the hills in the park forming waterfalls of varying sizes and heights. The county contains Dixon Springs State Park, one of many state parks in the Illinois Shawnee Hills, and is part of the Shawnee National Forest. It is bordered to the south and east by the Ohio River, which marks the state's border with Kentucky. In recent years, average temperatures in the county seat of Golconda have ranged from a low of 21 °F (−6 °C) in January to a high of 87 °F (31 °C) in July, although a record low of −22 °F (−30 °C) was recorded in January 1994 and a record high of 104 °F (40 °C) was recorded in August 2007. Average monthly precipitation ranged from 3.22 inches (82 mm) in October to 5.02 inches (128 mm) in May. As of the 2010 census, there were 4,470 people, 1,829 households, and 1,209 families residing in the county. The population density was 12.1 inhabitants per square mile (4.7/km2). There were 2,491 housing units at an average density of 6.8 per square mile (2.6/km2). The racial makeup of the county was 91.7% white, 6.0% black or African American, 0.6% American Indian, 0.2% Asian, 0.5% from other races, and 0.9% from two or more races. Those of Hispanic or Latino origin made up 1.4% of the population. In terms of ancestry, 31.8% were German, 19.1% were Irish, 11.4% were English, and 5.4% were American. Of the 1,829 households, 23.9% had children under the age of 18 living with them, 53.9% were married couples living together, 7.8% had a female householder with no husband present, 33.9% were non-families, and 29.8% of all households were made up of individuals. The average household size was 2.23 and the average family size was 2.72. The median age was 46.6 years. The median income for a household in the county was $39,672 and the median income for a family was $51,500. Males had a median income of $45,865 versus $28,519 for females. The per capita income for the county was $20,134. About 6.6% of families and 12.4% of the population were below the poverty line, including 18.4% of those under age 18 and 9.1% of those age 65 or over. ^ a b "State & County QuickFacts". United States Census Bureau. Retrieved July 8, 2014. ^ a b "Population, Housing Units, Area, and Density: 2010 - County". United States Census Bureau. Retrieved 2015-07-12. ^ a b "Monthly Averages for Golconda, Illinois". The Weather Channel. Retrieved January 27, 2011. ^ "Population and Housing Unit Estimates". Retrieved November 28, 2018. ^ "U.S. Decennial Census". United States Census Bureau. Retrieved July 8, 2014. ^ "Historical Census Browser". University of Virginia Library. Retrieved July 8, 2014. ^ "Population of Counties by Decennial Census: 1900 to 1990". United States Census Bureau. Retrieved July 8, 2014. ^ "Census 2000 PHC-T-4. Ranking Tables for Counties: 1990 and 2000" (PDF). United States Census Bureau. Retrieved July 8, 2014. ^ a b c "DP-1 Profile of General Population and Housing Characteristics: 2010 Demographic Profile Data". United States Census Bureau. Retrieved 2015-07-12. ^ "DP02 SELECTED SOCIAL CHARACTERISTICS IN THE UNITED STATES – 2006-2010 American Community Survey 5-Year Estimates". United States Census Bureau. Retrieved July 12, 2015. ^ "DP03 SELECTED ECONOMIC CHARACTERISTICS – 2006-2010 American Community Survey 5-Year Estimates". United States Census Bureau. Retrieved 2015-07-12. This page was last edited on 17 January 2019, at 23:39 (UTC).